Their hearts are in Israel; their bodies remain in Ethiopia. Will the story ever have a happy ending? Getachew Gebrei described his new yeshiva as a “light of Torah – wow!” Gebrei, an engineering student, is one of eight young men between the ages of 19 and 25 who are in Israel for six months on the first-ever Ethiopian leadership development and Torah learning program through Yeshivat Hesder Machanaim, part of the Ohr Torah Stone network, on the outskirts of Efrat in Gush Etzion. He told In Jerusalem that his college in Ethiopia “already added an additional year to my program, because I would not come to class on Shabbat. Coming to Israel means getting even more behind, but I did not even think twice.”Exchange student Tigabu Worku, who left a job as a security guard in Gondar, Ethiopia, expressed similar sentiments. This exchange was initiated by Benny Fisher, a retired head of the Administration for Rural Education and Youth Immigration through the Education Ministry. In that role, and his previous position as head of Yemin Orde Youth Village, Fisher worked closely with the Ethiopian community in Israel. He said families would regularly bemoan the lives of their relatives in Gondar and Addis Ababa, where the last 8,000 Jews in Ethiopia are living in poverty and longing to move to Israel and learn Torah. For six weeks, from December 2017 through mid-January 2018, Fisher decided to see for himself. He traveled to Ethiopia and volunteered, including opening a temporary beit midrash (house of learning) through which he would offer daily opportunities for the men and women of the community to study. Fisher arranged for the pilot program through the Israeli consulate, and then approached Ohr Torah Stone Chancellor Emeritus Rabbi Dr. Shlomo Riskin, who readily embraced the initiative. Fisher raised NIS 100,000 from private donors to buy plane tickets and brought eight young men to Israel on August 9. He is still working on securing another NIS 100,000 to support them during their stay. This is their first time in Israel and their first time taking part in formal Torah learning. Worku is the only student who feels comfortable speaking in Hebrew. The rest of the group speaks in Amharic and relies on their counselor, Addisu Gember – an Ethiopian-Israeli who made aliyah with his family 10 years ago – to translate. Worku said there is no yeshiva in Ethiopia, but members of the community learn together, often in their local synagogues. He said he was raised knowing he was Jewish and with a longing for the Holy Land. “I feel like I was born in Israel, even though this is my first time here,” he said. Ermias Gebrie said that when the group saw Israel through the window of the plane, they became emotional. Some of them even started crying. The group visited the Kotel in their first week in Israel. Ayele Andebel, who has large green eyes and an equally large smile, said when they were younger, they learned stories about the great Jewish Temple. They knew the First Temple was destroyed but had learned that a Second Temple had been rebuilt shortly thereafter. Only recently, when the community received access to new technologies, did they find out that, in fact, there was no longer a Jewish Temple standing in Jerusalem. When they arrived at the Western Wall plaza, they saw this was true. Rabbi Dr. Kenneth Brander, the new president and rosh yeshiva of Ohr Torah Stone – who himself made aliyah earlier this summer – said Fisher chose OTS because of its Yeshivat Hesder Machanaim and Straus- Amiel Practical Rabbinics programs, the latter of which trains young couples to become emissaries around the world and is located on the same OTS men’s campus. “We believe in learning and leadership, and we felt it was a unique opportunity to work with these eight young men and help them with their skills over the next few months,” said Brander. He said the staff worked to create a special learning program for the visitors, “which is no easy task,” given their lack of Hebrew and unusual cultural backgrounds. 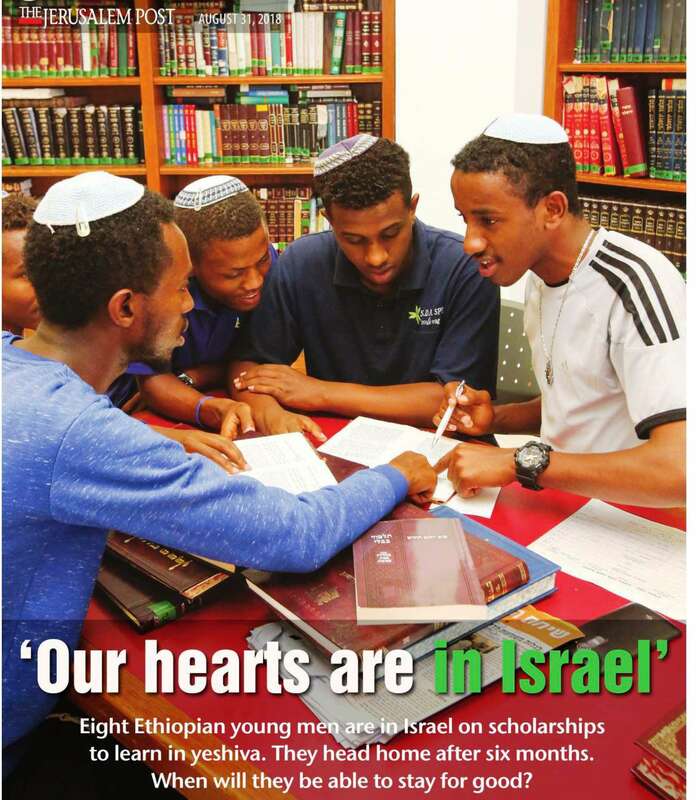 Rabbi Shlomo Vilk, head of the Machanaim yeshiva, said the Ethiopians’ day is divided into three parts: learning Hebrew and basic learning skills, one-on-one havruta learning with the other students and small group classes. Brander and Fisher said if the program is successful they would be open to running another round, perhaps even for Ethiopian women, who could be hosted by OTS’ women’s college in Jerusalem. While the OTS team is very accepting, it is unlikely that everyone else in Israel feels the same. The religious status of the Falash Mura is wrought with controversy. The Falash Mura are not considered Jewish by Jewish law, as they converted – albeit not through any formal means, in most cases – to Christianity in the 19th and 20th centuries. In 2002, the late Sephardi chief rabbi Ovadia Yosef ruled that the Falash Mura had converted to Christianity because of fear and persecution. Nonetheless, any Falash Mura who move to Israel undergo a formal conversion process and even those who have converted sometimes still face religious persecution in the Jewish state. For example, earlier this summer, Barkan Wineries announced a decision to remove its Ethiopian workers from departments in which they touch kosher wine – a decision based on doubt over their halachic status as Jews. After upgrading to the most stringent Israeli kosher certification, the Eda Haredit ultra-Orthodox kosher certifier required the winery to prevent Ethiopian workers from touching the wine, in accordance to Jewish law that prevents the consumption of wine handled by non-Jews at key points in the winemaking process. The Falash Mura are not entitled to make aliyah under the Law of Return, but special government decisions have granted them permission to come to Israel in waves over the last decades – but not all of them. Some 8,000 Falash Mura continue to live in Gondar and Addis Ababa, in hopes that they will one day join their immediate and extended families in the Holy Land. Israel made two landmark rulings in 2003 and 2010, tasking the Jewish Agency with bringing thousands of Falash Mura to Israel. The 2010 cabinet decision delineated three criteria for Falash Mura making aliyah: that an individual has Jewish lineage from his mother’s side; that the individual apply from Ethiopia; and that his family in Israel also submit a request. Only those who met these criteria were brought to Israel in 2013. Facing political pressure from Knesset Immigrant Absorption Committee head Avraham Neguise (Likud), in November 2015, the government made a formal decision to bring the remainder of the Falash Mura to Israel based on family reunification. The decision was not, however, made in conjunction with a budgetary allocation to cover its costs, so its implementation was stalled. In 2017, the government budgeted for the immigration of 1,300 people, who did indeed arrive during that year. Almost everyone agrees that the failure to fully implement the November 2015 decision is because the government has failed to appropriate the requisite funds. In June, a ministerial committee meeting headed by Prime Minister Benjamin Netanyahu was supposed to vote on a plan that would have completed this process, but the vote was delayed. In July, 70 Knesset members, led by Neguise, signed a letter sent to Netanyahu demanding the government immediately implement the decision made three years ago to let the last 8,000 Jews immigrate. Days later, a mass protest of some 1,000 people was held in front of the Prime Minister’s Office in Jerusalem – but action has yet to be taken. Brander said he is not concerned about the religious status of these eight young men. For his part, Vilk said he hopes the larger controversy around their aliyah will not drag the young men into politics and pull them away from their studies. This will be easier said than done, for a group of young men who say they long only for Israel. “This is where we belong, with all of the Jews from around the world,” said Getasaw Fasikaw. Sometimes they say, “You are a Falash Mura, not a person – they don’t see the Jews as people,” Worku said. He said non-Jews won’t rent the Falash Mura apartments, because they say the Jews will stuff their toilets. And if they do allow Falash Mura to move in, they’ll charge double or triple price, claiming relatives in Israel can send them money to pay for it. As a result, most of the Falash Mura live in one-room mud huts in the village, with no running water or proper sanitation facilities. “We deserve to come here for what we have endured,” said Gebrei. Each of the young men talks about their family in Israel. This one has cousins, another parents or grandparents, many siblings. They were all reunited at the airport, which only added to the emotion of the day. “They all have the same story,” said counselor Gember, who is now married with a child and learning in the OTS program, too. He said every time a politician arrives in Gondar, the community is given false hope. Justice Minister Ayelet Shaked was in Addis Ababa in April; President Reuven Rivlin visited one month later. Hope. Faith. These are the words the students repeat one after another. “God promised to bring all the Jews back to Israel from the four corners of the earth,” said Takele Semahgn.